I never gave much thought to library marketing until I met Angela Hursh, content team leader in the marketing department of the Public Library of Cincinnati and Hamilton County. Going to my neighborhood library to browse and check out books is one of my favorite things to do; I’ve been visiting on a regular basis for as long as I can remember. As a dedicated bookworm, I took for granted the effort of marketing the library does to reach people for whom visiting isn’t second nature. While my personal interest is book-centric, libraries offer much more to the local community, of course. At the library you can learn a new language, get help with your income taxes, or use a 3-D printer. Parents can bring their kids for story time. Teens have a safe, comfortable space in which to do their homework. Senior citizens can take computer classes. This is one of the biggest challenges for libraries today: updating people’s perceptions of libraries as merely buildings full of books. Perhaps even more thorny for their efforts is that it’s not clear exactly what libraries should aim for as they evolve to meet changing community needs. Pew Research Center shows that Americans are divided on the question of how books should be treated at the library: 24% support the idea of moving books and stacks to make way for more community- and tech-oriented spaces, while 31% say libraries should not move the books. As marketers, we live by the mantra “you can’t be all things to all people.” But that’s really what a library does, says Hursh. Modern libraries are book repositories, resource centers, and gathering spaces – doing everything from carving maker spaces for hobbyists and hosting equipment rental programs so that community members can “borrow” items like sewing machines or hand tools, to setting up co-working spaces for virtual workers. When Hursh joined the team, the library used some social media platforms but had no overarching content marketing strategy for them. Now, the team is constantly evaluating and evolving how it uses social media to reach the local public. “Pinterest surprised me,” says Hursh. After adding the platform into the mix, the team saw Pinterest drive 15 to 25% of web traffic, mostly from posts about new books and movies. LinkedIn was also surprisingly popular as a channel; audiences there look for career and higher education resources from the library. “We work in a building full of stories,” says Hursh. Therefore, content marketing makes a lot of sense for libraries that want to attract patrons. But marketing library collections and services is much more nuanced than letting people know about the great books and fun events at the library. When Hursh talks about telling stories, she means stories about the history of the library, stories about the librarians, and stories about the patrons themselves. All locations have their own personality shaped by their neighborhoods and demographics, Hursh explains. Her team creates content specific to the audience of each branch, as well as more global content for the library system. Social listening helps the team come up with stories, such as the one about a father and son who made it their mission to visit all 41 locations of the Public Library of Cincinnati and Hamilton County. In addition to targeting its content marketing by location, the Cincinnati-area library sometimes works with more specific targets. Book Hookup is a service through which the library staff provides personalized reading recommendations to customers based on their reading interests. Hursh’s team was responsible for naming and promoting the program to the public. Working with OrangeBoy, an Ohio-based company that developed marketing personas based on library card usage data, Hursh and her team create email marketing messages based on those behavior-based user personas. The targeted email marketing has been wildly successful, she says. 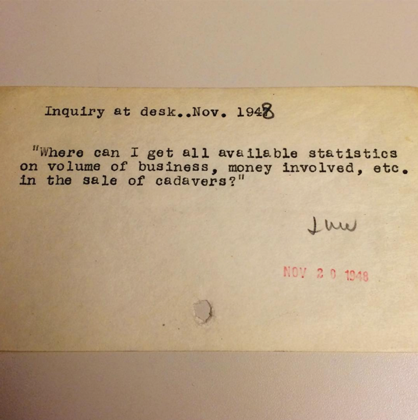 The response from customers was so overwhelming that the team was asked to pause marketing activities to make sure the library staff had time to respond to the requests in a timely manner. A book-focused library-goer may be surprised to see the jam-packed events calendar at their local library. At the Public Library of Cincinnati and Hamilton County, events and classes happen almost every day, from toddler play dates to karaoke for teens to a book club for seniors. While the programming department is responsible for the events, Hursh and her team create content to market them to the community. 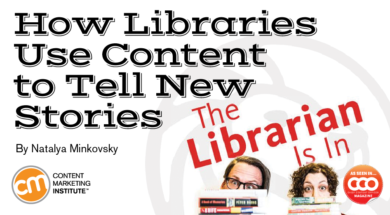 In addition to social media, the Public Library of Cincinnati and Hamilton County has an active email marketing program, a quarterly publication, and a podcast recorded by the library’s writer-in-residence who also authors a blog. With limited resources, Hursh says, the library has been cutting back to create fewer but more engaging programs. For the content team, that has meant focusing on more targeted promotion and creating less content overall. While her team focuses on creating the most effective content driven by performance metrics, as a team leader and content evangelist, Hursh says she and her team make sure to leave room for creativity. From brainstorming sessions in the reading garden to attending Creative Mornings, a breakfast lecture series for the creative community, she looks for ways to balance process and efficiency with creativity. The Public Library of Cincinnati and Hamilton County is on a mission to connect people with the world of ideas and information, and Hursh and her team are helping achieve that mission one story at a time. NYPL is a regular participant in this Instagram hashtag for which readers pose with book covers replacing their faces in clever and often humorous ways. 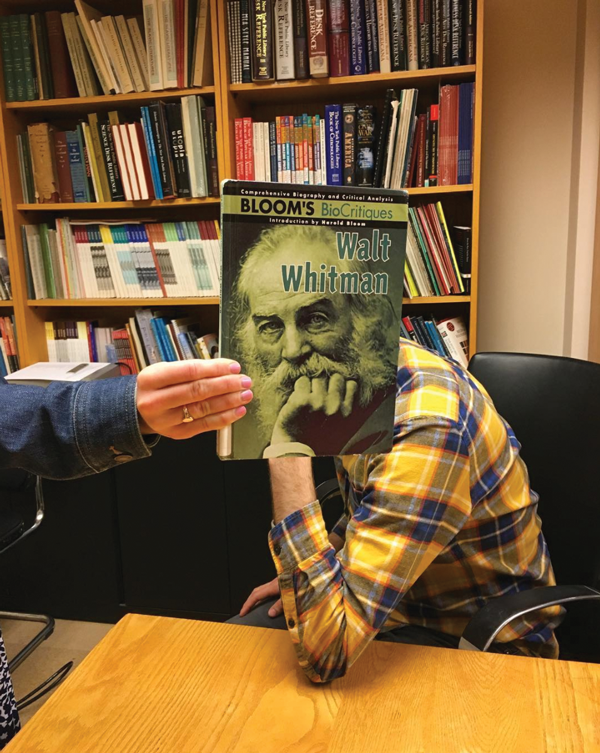 The library not only posts its own #bookfacefriday contributions but reposts from other libraries across the country. 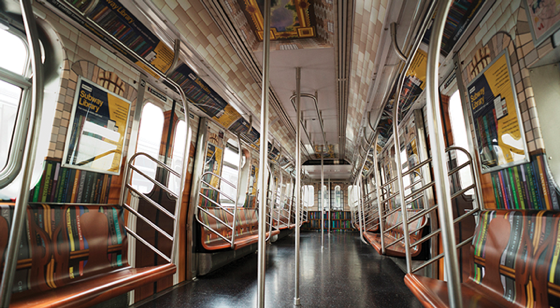 The Subway Library, created as a partnership between NYPL and MTA, provides New York City subway riders with free access to e-books, excerpts, and short stories to read on the train. Riders on the E and F lines also had the opportunity to ride the Library Train, the interior of which was designed to look like the NYPL’s famous Rose Main Reading Room. It’s no surprise that the public library system in one of the fashion capitals of the world has an impressive collection of fashion illustrations and photography. 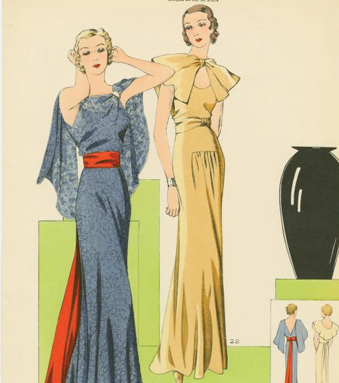 These stylish images from the NYPL digital collection are on display every Sunday, joining thousands of others showing off their #sundaystyle looks on Instagram. One of two podcasts from NYPL, The Librarian Is In is a weekly discussion about books and culture. In the producer’s words, the hosts “interview guests from the world of libraries and beyond, discuss the books they’re reading, and recommend their favorite titles.” Readers looking for more recommendations can follow the NYPL Recommends accounts on Facebook and Twitter. On Friday mornings, the librarians respond to #fridayreads requests on Facebook Live and Twitter with recommendations. In Washington, D.C., the Library of Congress is the main research arm of the U.S. Congress and home of the U.S. Copyright Office. That’s serious business but, in 2017, the Library of Congress threw one of the district’s largest, loudest, and most sparkly events when its Bibliodiscotheque program series culminated in a disco dance party featuring a performance by legendary “I Will Survive” singer Gloria Gaynor. The month-long celebration of disco included lectures, film screenings, and a symposium, all while highlighting disco-era materials from the Library of Congress collections. While the Library of Congress collections, exhibitions, and events are open to the public, being a research library headquartered on Capitol Hill means the District’s bookworms are more inclined to associate it with academia and politics than with programming for the locals. To promote Bibliodiscotheque, the Library of Congress partnered with D.C.-based organizations including events agency Brightest Young Things, the District of Columbia Library Association, and Capital Pride. Bibliodiscotheque was the first time the Library of Congress dedicated extensive programming to a music genre – and the first time its Great Hall was home to a late-night dance party. Local bibliophiles and disco fans snapped up the 1,500 party tickets in under a minute. I think it’s safe to say that the Bibliodiscotheque disco party was also the first time that many people stood in line to get into a library. What have you seen or experienced from your local library? Share in the comments. Get insight on how to be a content librarian and much more about the strategy of content at the Intelligent Content Conference March 20-22 in Las Vegas. Register today and use code BLOG100 to save $100.